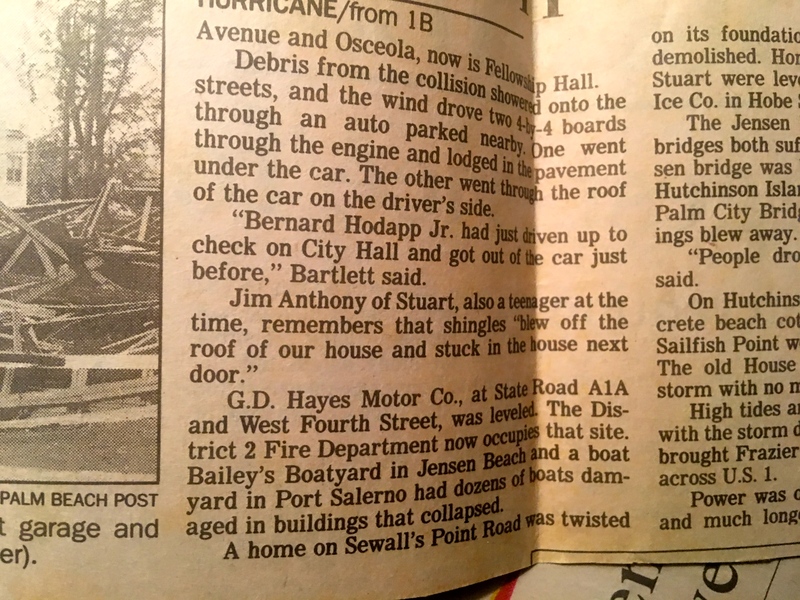 ~Jay Barnes, author of the 1998 book, Florida’s Hurricane History as quoted in Palm Beach News Daily. 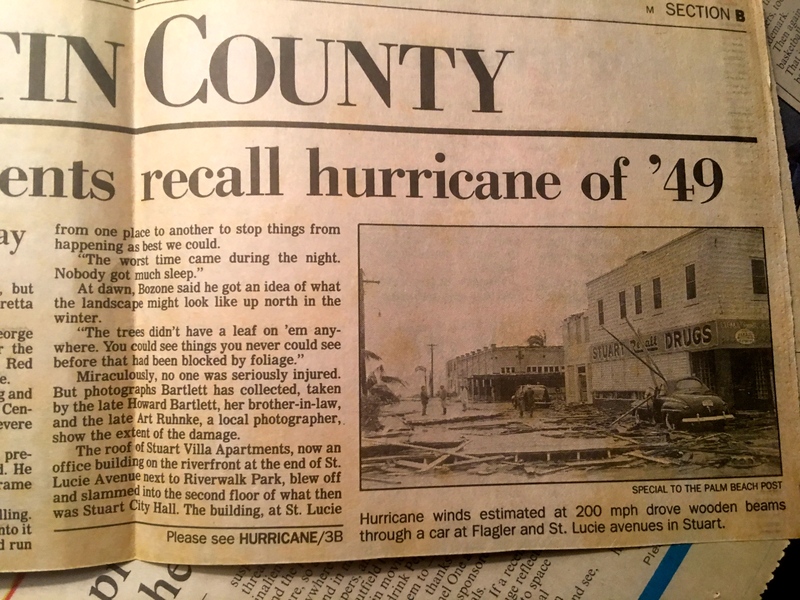 With all the talk of hurricanes this year, and people still shook up from Hurricane Irma, I asked my mother what year held the record as Stuart’s strongest storm along the St Lucie River/Indian River Lagoon. 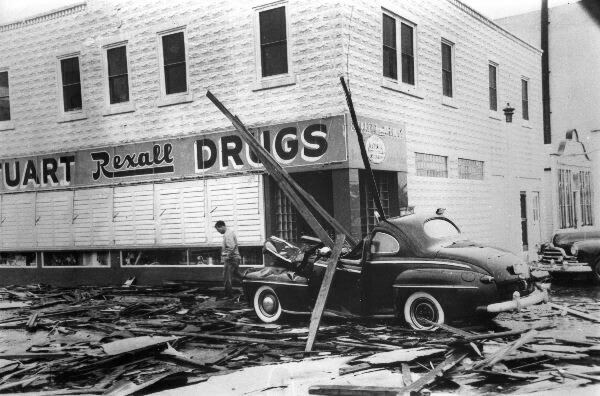 During this time, storms were unnamed and of course there was not today’s technology or communications. 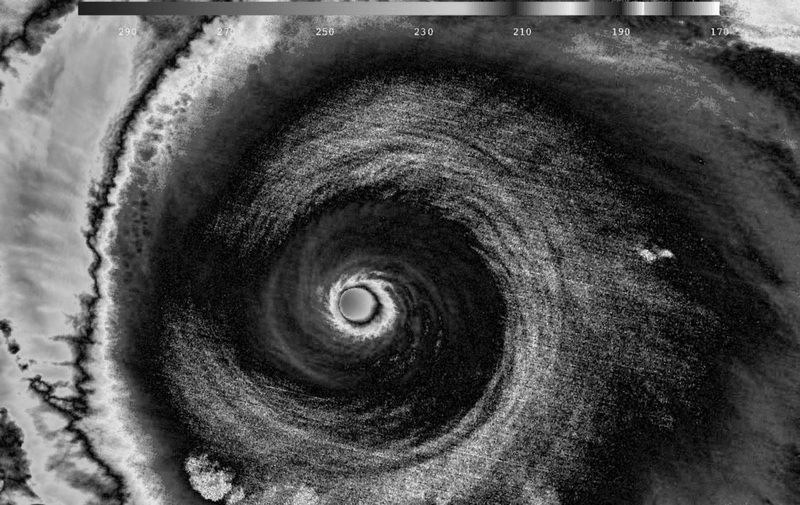 The storm is recorded to have had Category 4 winds (130-156 mph) when it struck the Florida Coast near West Palm Beach. 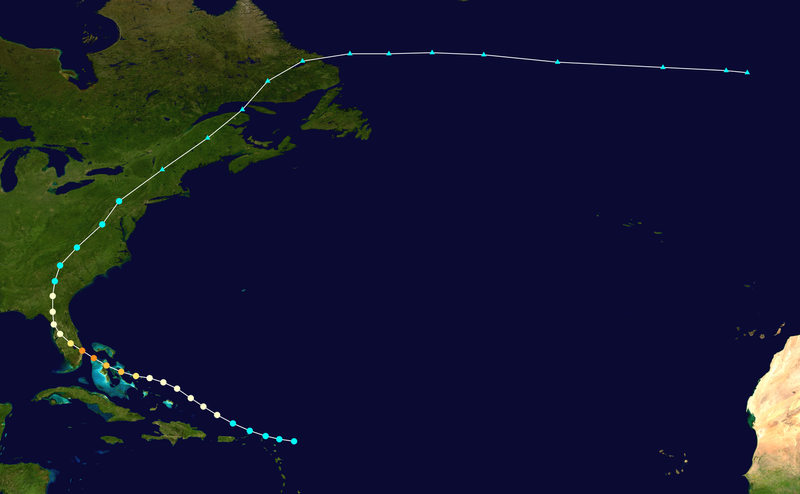 That put Stuart on the northeast side of the storm receiving the highest winds, and records show gusts much higher. 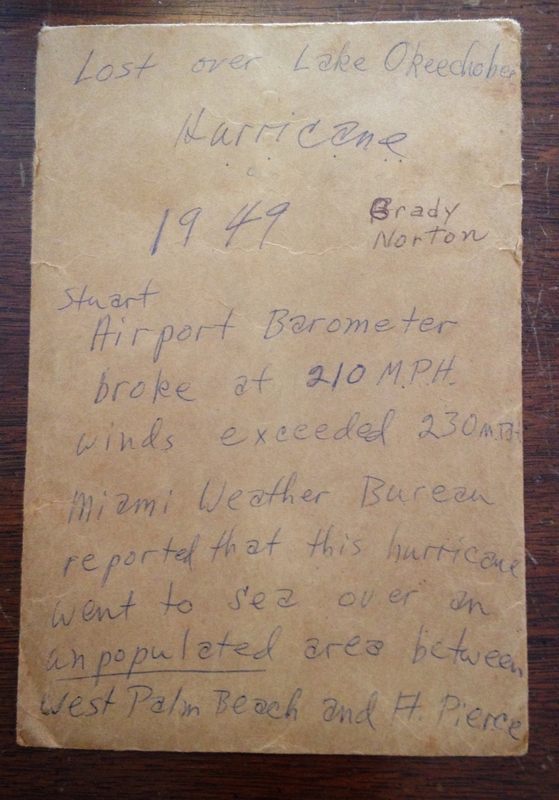 Mary Jones, the director of Stuart Heritage, has a primary source regarding this storm with some amazing numbers. The source is an envelope from the Garnett Rushing Early Collection. 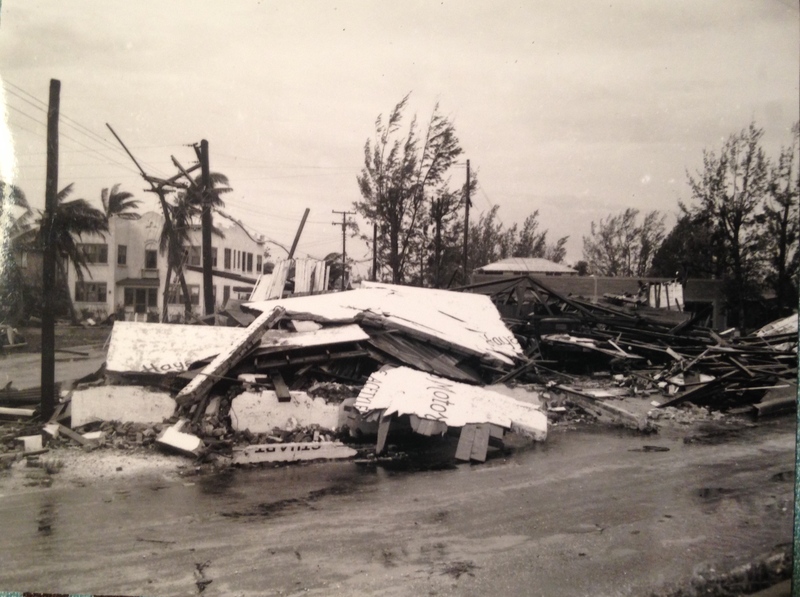 Mrs Rushing was from a pioneer family and this is what is written on the envelope as the hurricane tore through Stuart in 1949. 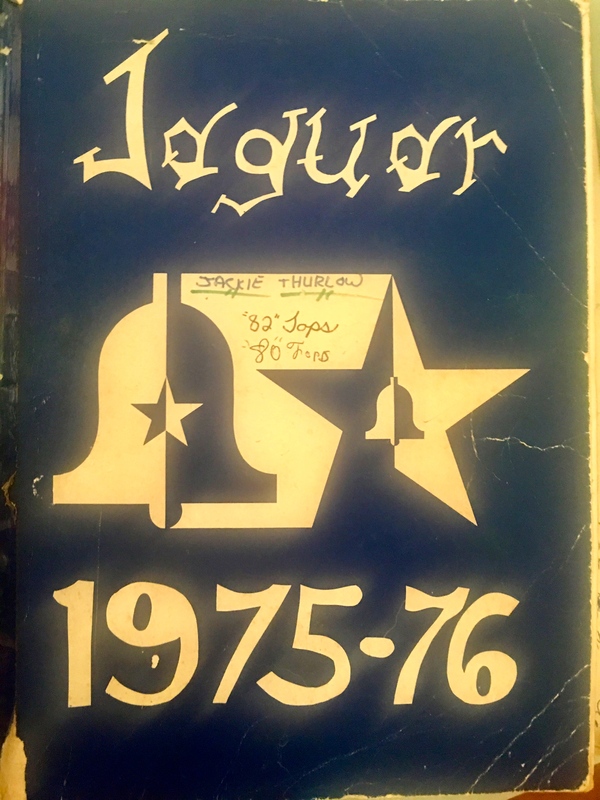 An envelope from Stuart Heritage’s collection. The envelope is from the Garnett Rushing Early Collection courtesy of Stuart Heritage Museum Director, Mary Jones. 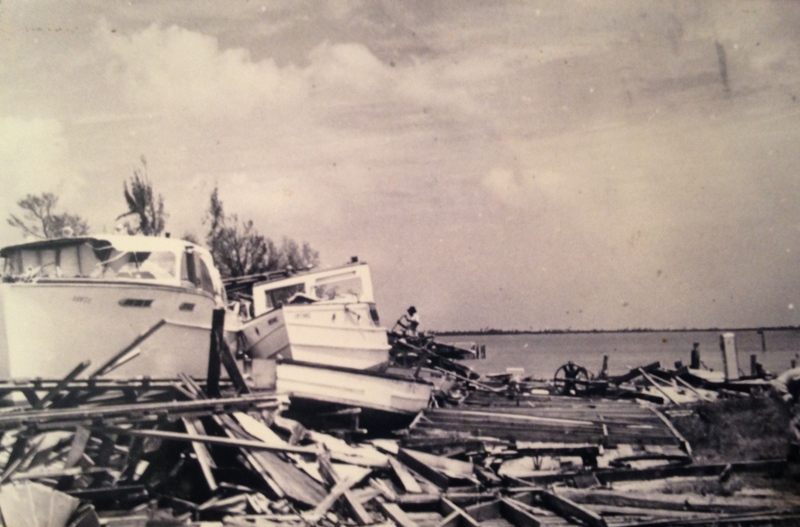 Photos from the 1949 Hurricane in Stuart, Florida, Mrs Sands. Archives of Sandra Henderson Thurlow. Newspaper articles from the archives of Sandra Henderson Thurlow. Note Sally Eaton is Sally Schwartz. 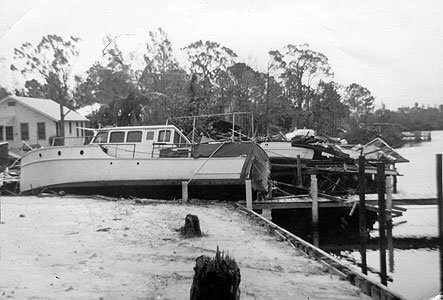 1949 Hurricane Aurthur Ruhnke, Thurlow collection. 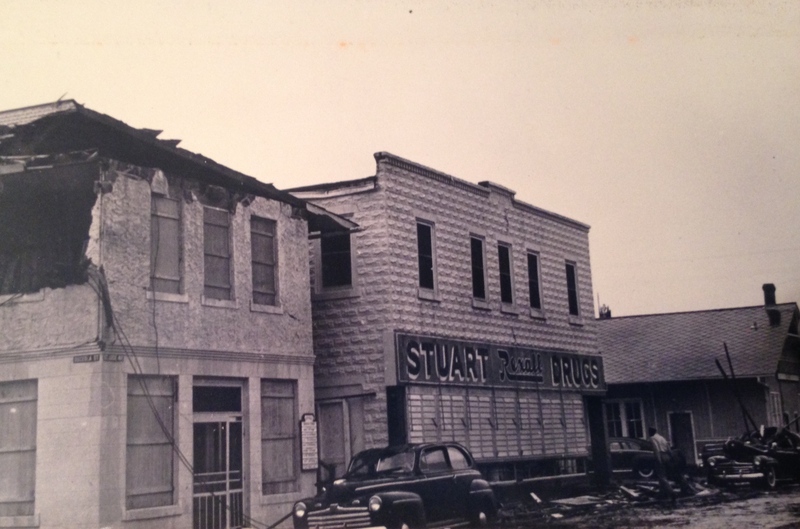 Left, 1947 photo of Stuart High School that today is the location of the Martin County School Board Administrative Buildings. Right, “The Log Cabin,” that is now located at Langford Park in Jensen Beach/Rio. 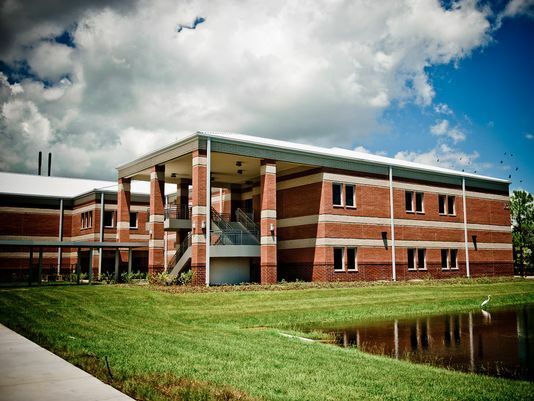 Today’s Stuart Middle School along East Ocean Blvd. is located exactly where this pond used to be. 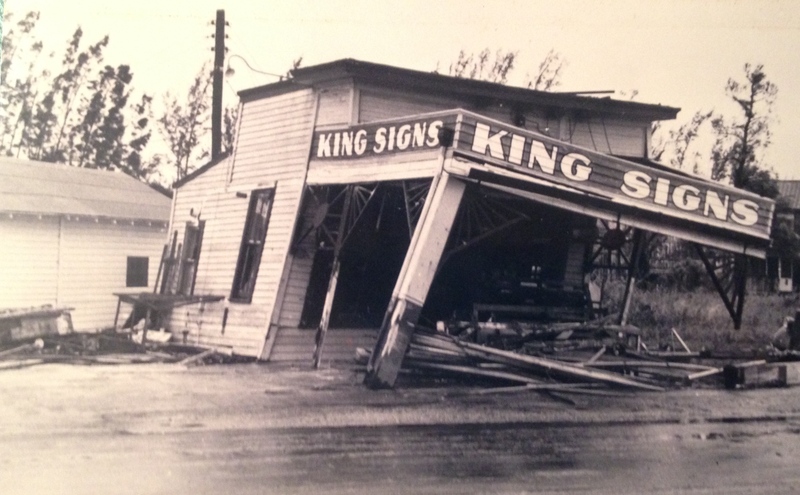 Photo shared by historian Alice Luckhardt from Clyde Counant, Thurlow/Collection. Google Earth (from opposite direction) shows 2017 image of today’s Stuart Middle School (large roof in middle of photo, marked as #102 East Ocean, Stuart) at corner of Georgia Ave and East Ocean Blvd. The school is built IN the area where large pond once was located that you see in the 1947 black and white photo above . 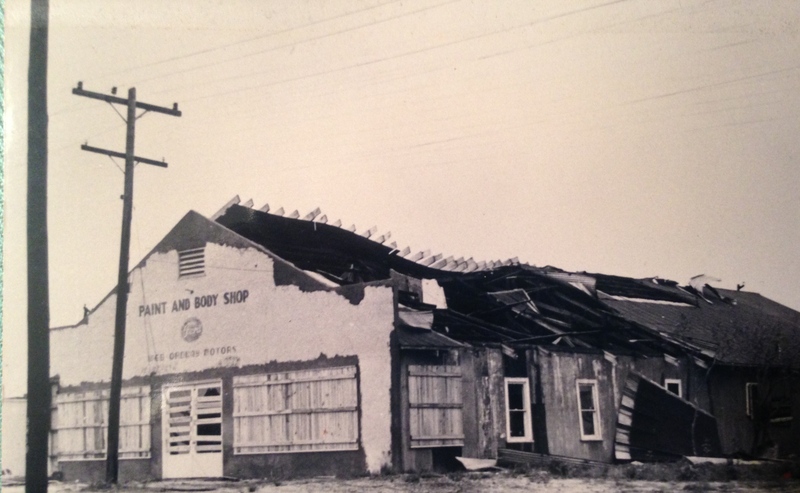 Notice the small depression to the right of the building. That is what is left of the pond. 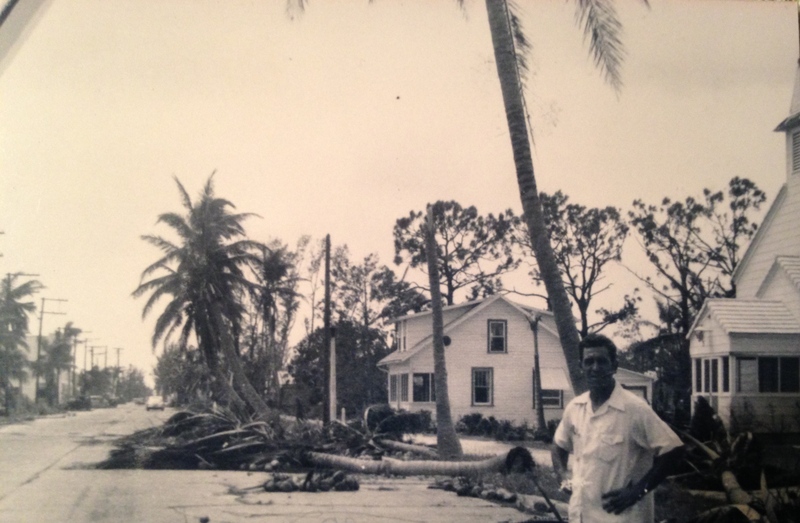 This week, with a short reprieve from politics, I have been sharing historic photos and videos of the once wetlands and ponds of East Ocean Boulevard. 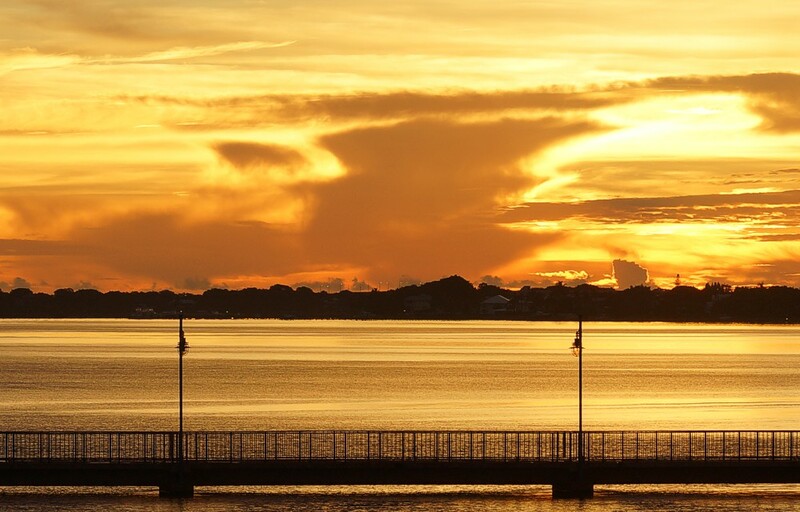 Land use changes interest me as land use is of course directly connected to the water quality and health of our St Lucie River/Indian River Lagoon. 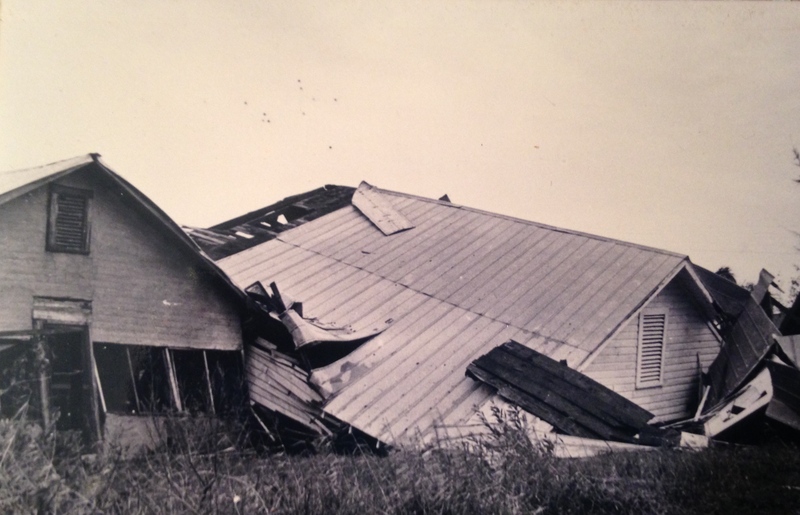 After reading yesterday’s blog, historian and family friend Alice Luckhardt, shared the remarkable 1947 photo above. I wanted to make sure everyone saw it as well! Look at the size of that pond that once was at Stuart Middle School! I remember it; do you? Now it’s gone. 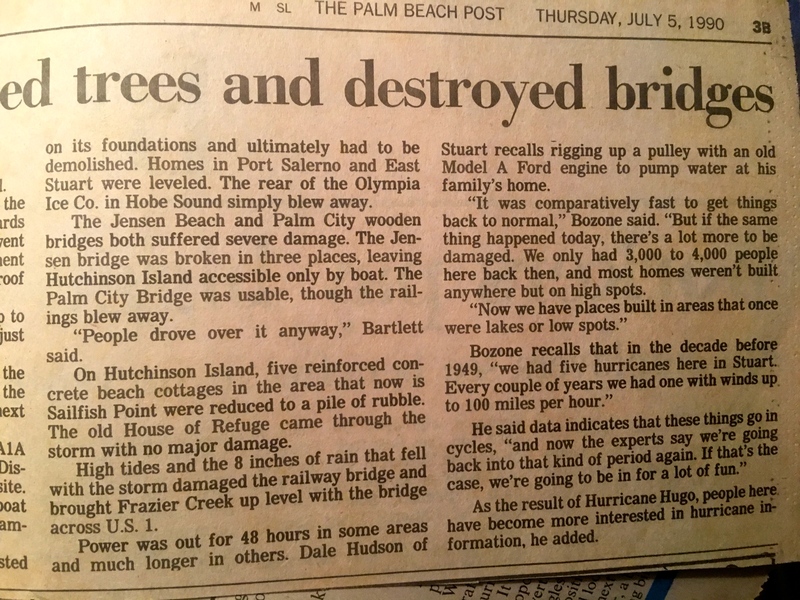 Alice has included two old news articles, featured below, explaining how students, two different times, did save the pond from destruction in both 1964 and 1971, but no one spoke up during the real estate boom era of the 2000s when the “new Stuart Middle School” was built. Why didn’t the adults save it? 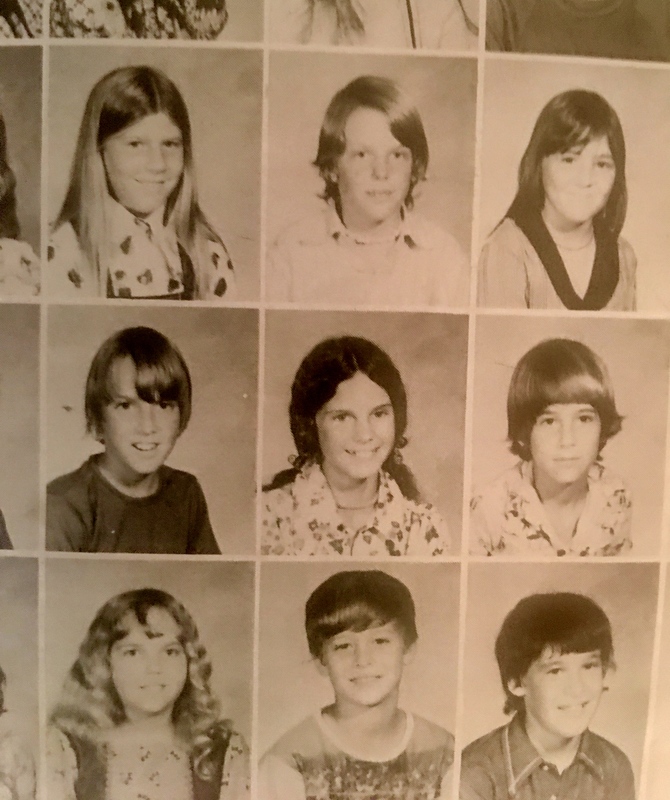 Now I must state that I love Stuart Middle School as I attended there as a student and taught there as a teacher, but this disappearing pond act is incredible and should be noted. 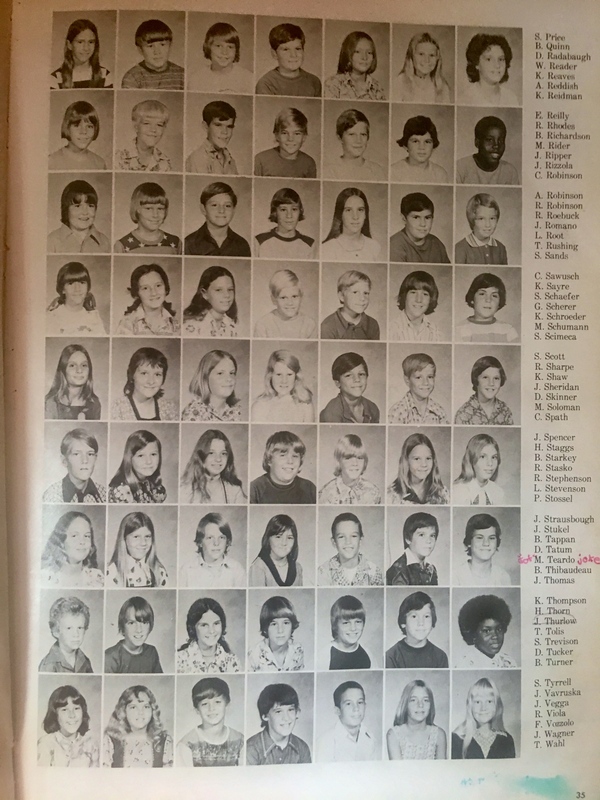 At the time I saw it happening, I did write a personal note of concern and disbelief to the current principal who did not write me back. Now that I am a “politico” person, I understand the principal does not make these decisions. 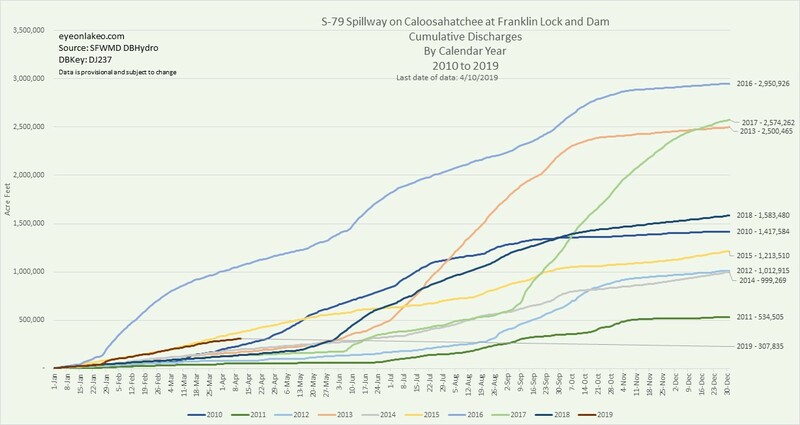 Yes, the goal is always to make it “easier,” for we humans, unfortunately over time this adds to the desolation of our St Lucie River…Easier is not the answer. Well enjoy Alice’s articles below! Thanks, everyone; see you at the fishin’ pond. Center JTL 6ht grade at SMS. Nice hair doo. 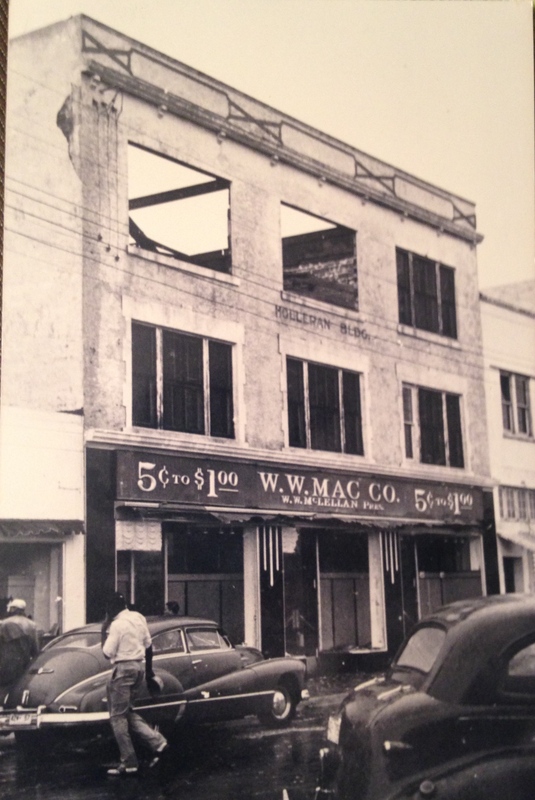 Photo Stuart, Florida, in 1947. Source: Clyde Coutant Photography, Thurlow/Collection. An aerial with Stuart High School on left and the pond and Log Cabin on right. The pond at Stuart Junior High School will not be filled. Instead, its water level will be restored, its banks will be graded to stop erosion and it will again be the habitat of water lilies and fresh water fish. Martin County School Board Monday night approved a plan advanced by six local conservation groups: Garden Club of Stuart, Izaak Walton League, St. Lucie-Indian Rivers Restoration League, the Historical Society, Junior Conservation Club and U. S. Soil Conservation Service. Charles Kindred, president of the Isaak Walton League, detailed the plan, which involves grading of the banks with county equipment, stabilizing them with Bahia grass and other plantings, installation of a well and one and a quarter-inch pump, operated by the city, to maintain the water level at three or four feet during drought periods and the planting of bream and bass. The pond on the campus of the Stuart Seventh and Eighth School is in the final stages of renovation. Assistant Superintendent of Schools Jack Smouse said that the pond is somewhat of a landmark in the community and that it has been here “as long as I can remember.” School officials have intended to update the pond for some time, Smouse said and with the cooperation of the city and the county the work has been done. The county donated a dragline and the city provided fill for the project. The pond was originally designed with two separate islands in the center. Smouse said the design made maintenance difficult. Transporting mowers and other equipment from one island to the other was virtually impossible without a boat. With the fill which the city provided, the two islands have been connected. Smouse said the pond was originally dug to provide fill for other areas and that the spoil taken from the recent work will be used on the campus. Moves to fill in the pond in the past were blocked by local conservationists, Smouse said. They felt that if the pond is eliminated the city will lose one of its areas of beauty. The digging is now completed and the next step is to clear the area of cattails and other debris. When this work is complete the area will be planted and stocked with fish. Smouse said it will provide a fresh water pond for the area and will be used primarily as a “classroom” by the science department at the school. The pond is filled by surface water from the campus. In the past, storm sewer drainage went into the pond, but with the present drainage system this is impossible, Smouse explained. With the present low water table the surface water will be the only method of fill in the pond. Smouse said that eventually the school hopes to erect a flagpole at either end of the island with a school sign. 2000s: “quiet as a mouse”….pave it over! 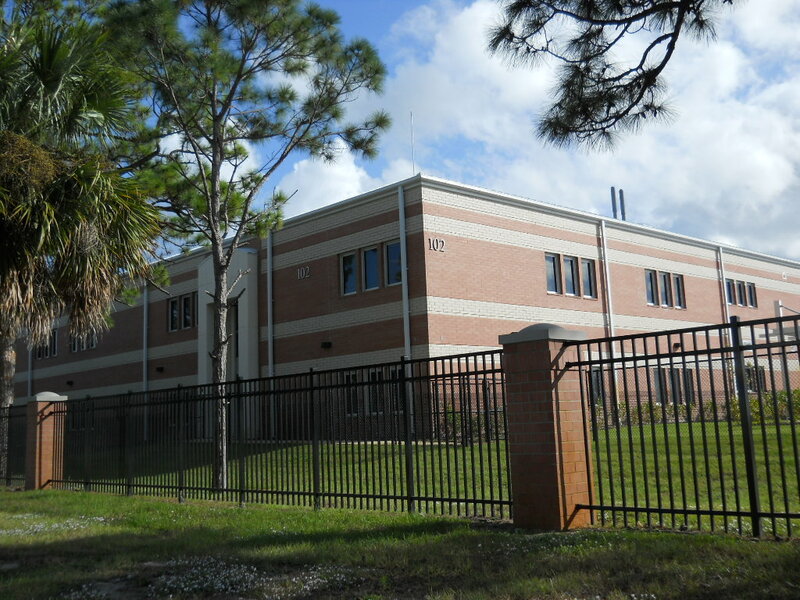 Stuart Middle School along East Ocean Blvd. 2017. Photo courtesy of website. The remaining pond at Stuart Middle School. Photo courtesy of website. Sharks seem to be feared more than they are respected….but that perception is changing as their endangered status becomes more critical and well-known. 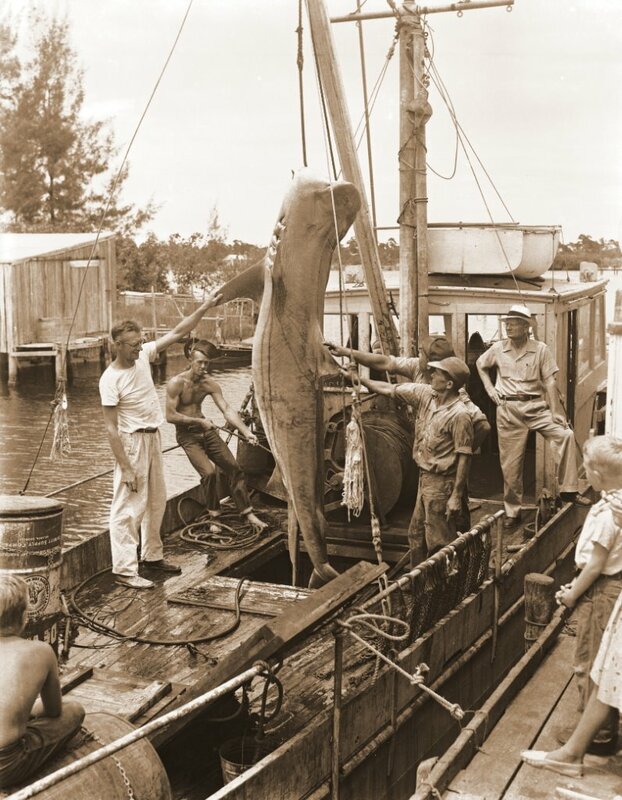 As most things that have to do with natural resources and the environment, there were few concerns regarding the “overfishing of sharks” in Florida the 1930s and 40s. Their supply seemed endless, and their value to the oceans and ecosystem was not widely understood. During the 1930s, sharks provided important resources to society and gave fishing families a stable income. During World War II vitamin A was a hot item, especially for pilots pursuing accurate night vision during their dangerous missions. 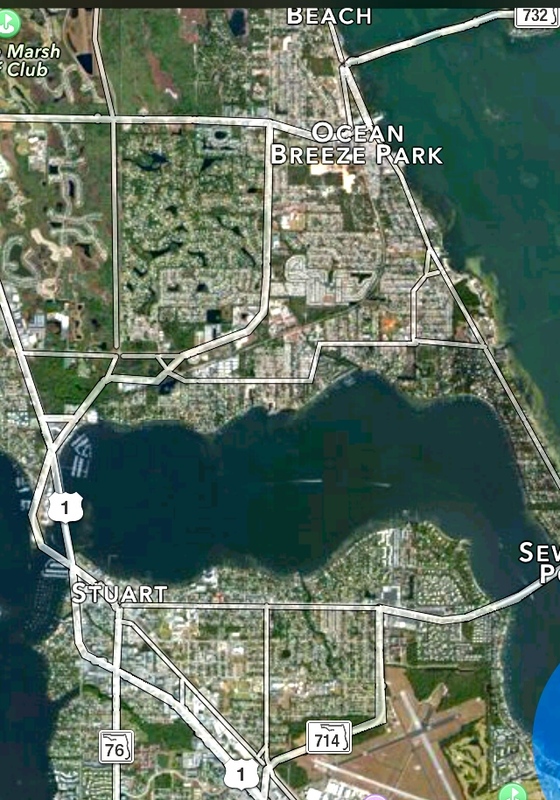 Another interesting forgotten historical fact?….believe it or not, “by mistake” the first “shark repellent” was tested and created right here by local fishermen—yes–right off the St Lucie Inlet off our St Lucie River/Indian River Lagoon. It was “top-secret” and it worked! 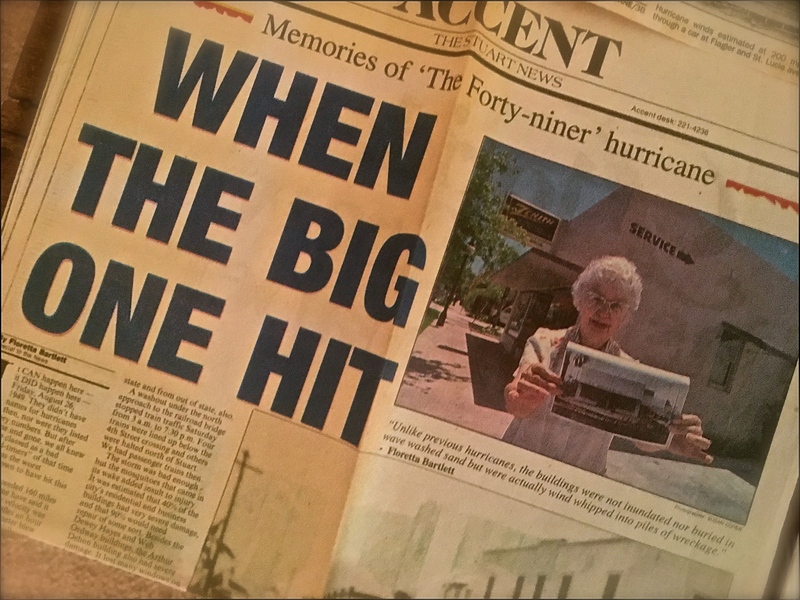 Today I will feature a vignette of family friend, historian, and Miami native, Alice Luckhardt. 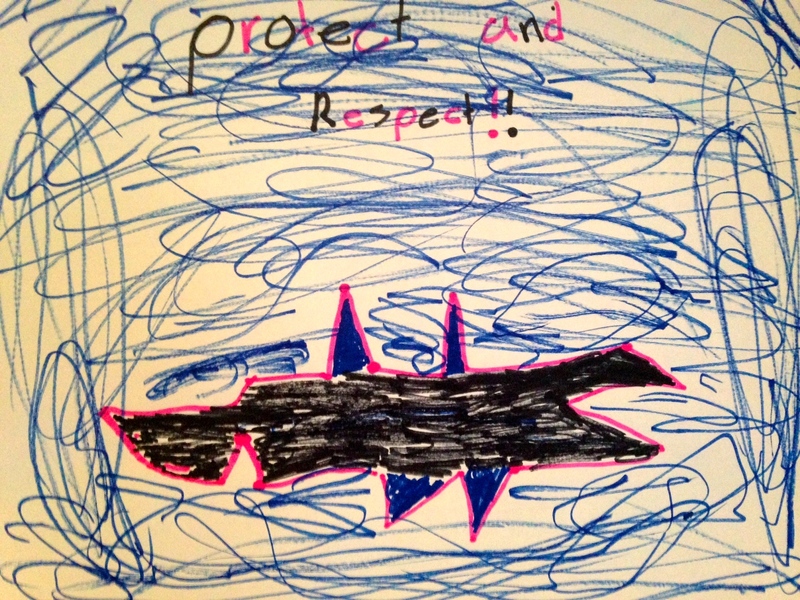 Her very informative and comprehensive text is about Port Salerno’s shark fishing history. 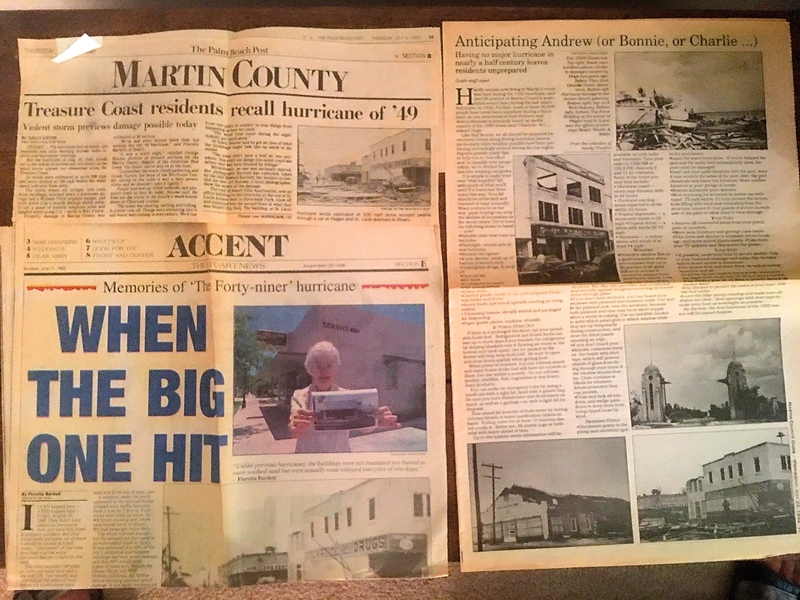 Alice and her husband, Greg, have written hundreds of historical accounts that are shared in the Stuart News and are also part of the public archives of Martin County’s Stuart Heritage. Thank you Alice for these important historical resources! 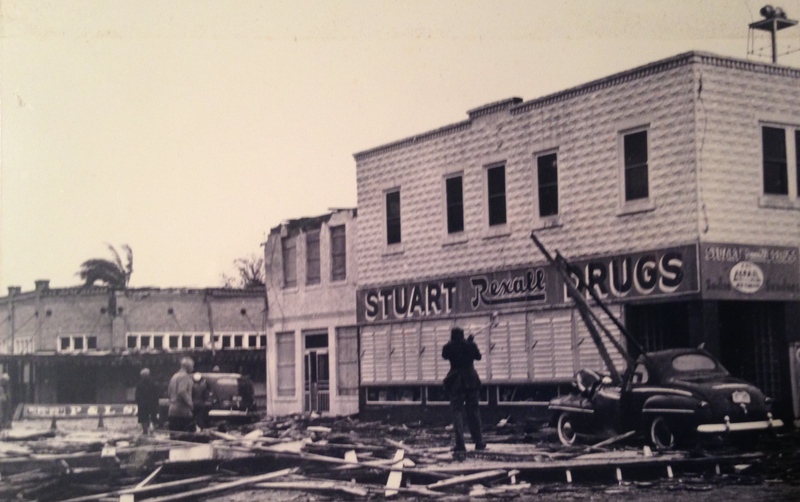 “Old Stuart,” The big city! 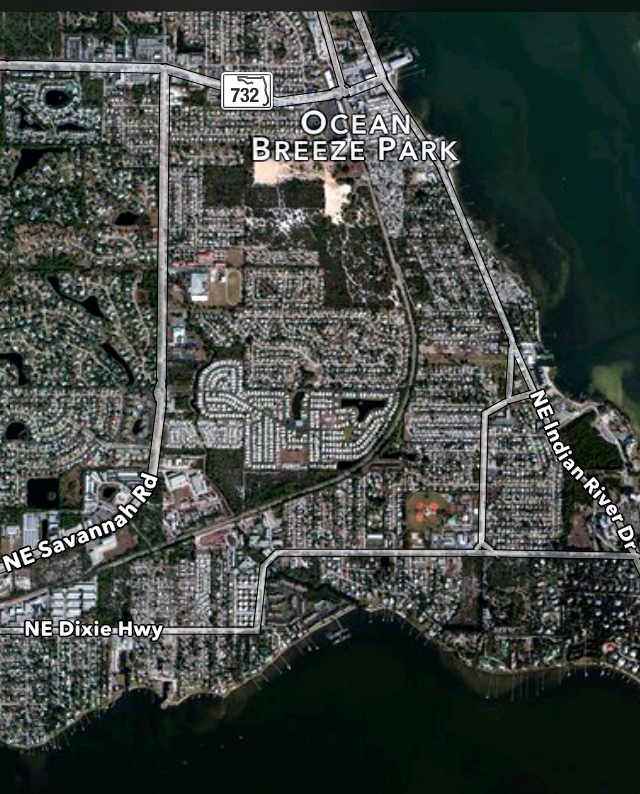 Salerno would have been much less developed and smaller than this south by about 10 miles. STUART – Vitamin A, essential for good human health was once derived from oil extracted from the liver of sharks and a leading supplier of this valuable substance was the tiny fishing village of Salerno. Shark liver oil was believed to promote wound healing, stimulate growth, increase resistance to infection, aid in combating fever and colds, improve eyesight, prevent excessive dryness of the skin as well as an overall general remedy for conditions of the respiratory tract and the digestive system. Generally, the livers, chopped into fist-sized chunks, were rendered down in big vats. The oil could be skimmed off, cooled and canned, ready for shipment. In the 1930s, assisted by brother George, Captain Charles L. Mooney’s Salerno Shark Industries-Fisheries, Inc., supplied not only the needed shark liver oil and novelty shark teeth for jewelry, but also the outer skin hide of the sharks. In 1938, an order was placed by a Chicago firm for 200,000 shark teeth. The Ocean Leather Corporation processed the skins into leather goods, primarily luggage. Fins, considered a delicacy by some, were shipped to China. From its meager beginning, Mooney had continued to make improvements in the business, increasing boats, buildings and processing methods. 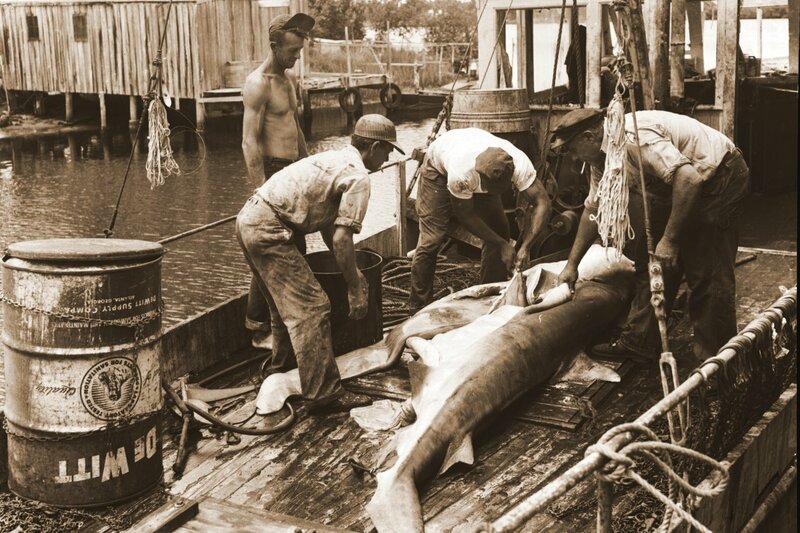 By 1941, a shark meal plant, measuring 36 x 65 feet and equipped with hammer mills, drying machines and conveyors, enabled the profitable use of all of the shark’s carcass, accommodating about 200 pounds an hour. An aroma filled the air as the cooker, steam boiler, hammer mill, flaker dehydrator and sacker completely finished the process, ready for shipment, the ‘meal’ eventually to become food for dogs, cats and poultry. To supply these industries, thousands of sharks were caught in the Gulf Stream and elsewhere, sometimes as many as 600 in a single week. 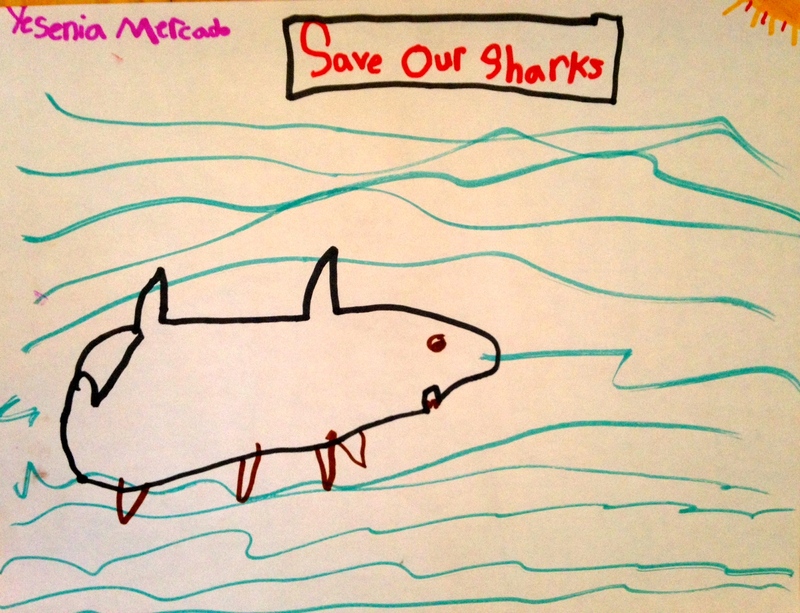 Scientific analysis and studies were conducted to determine the best use for shark products. 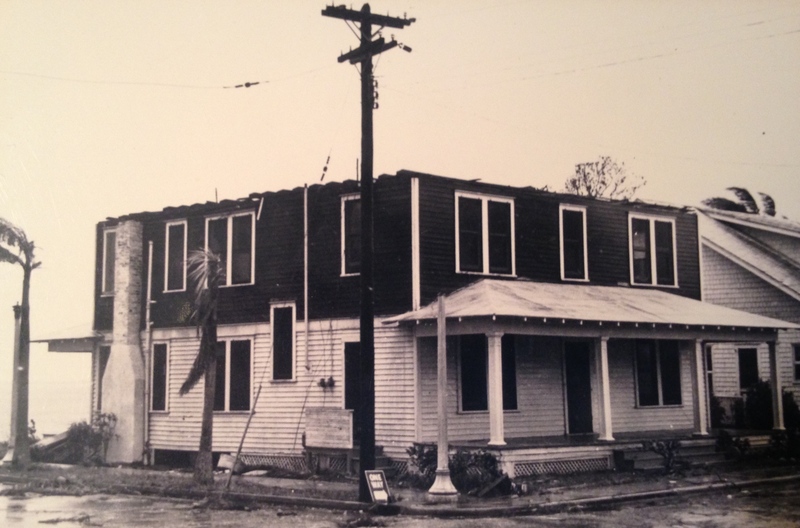 In the 1940s, Robert M. French, Sr., who had founded the Shark Fisheries of Hialeah, Florida, headed the Salerno site, joined later by his sons Robert Jr. and Price, Mooney having previously relinquished his interest due to ill health. In 1944, the Shark Fishery was purchased by the Borden Co., one of the largest users of Vitamin A in the US, retaining R. M. French Sr. as chief executive. Borden’s primary interest was to increase vitamin production, from shark liver oil, to fortify and enrich its milk products. The liver, being a main source of Vitamin A, was considered of utmost importance in the war effort, with supplies from world markets having been cut off. The vitamin was important not only for the health of the soldiers, but especially for night fliers who took the vitamin before take-off to see better in the dark. Actually, during those years, a very secretive study was also being made which involved the Salerno fishery, the details of which were known by only about three or four people in the area. Although sharks will sometimes attack and eat other living or freshly killed sharks, it was noticed by the fishermen that hooks which had been baited with cut-up pieces of the flesh from sharks caught the day before, were virtually left untouched and that, furthermore, the sharks actually avoided the area, not returning for days. With that information, the US Federal Government under the Office of Strategic Services, employed Stewart Springer, from Homestead, Florida, a chemist, to work with the Salerno plant to further investigate and conduct experiments, the end results being the development of a shark repellant. Known as ‘Shark Chaser,’ it proved to be invaluable in saving the lives of sailors or aviators forced down at sea in shark-infested waters. According to Robert and Price French, interviewed later, it was difficult to have to pretend “nothing unusual was going on” as the experiments involved the cooking of thousands of pounds of shark meat in barrels of an alcohol solution, the aroma definitely attracting some attention. 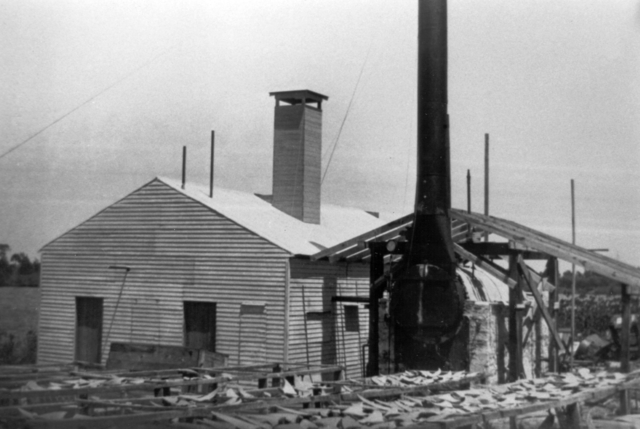 By 1946, the shark fishery plant, one of only three of its kind in the U.S. was considered essential to public welfare and continued to supply shark liver oil and other products. 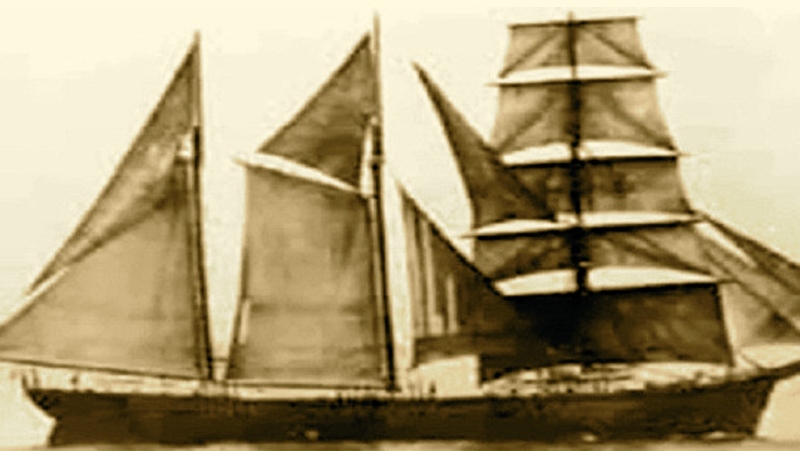 Borden expanded and improved the facility which at its height employed as many as 50 people and used 12 boats to haul in the ‘tigers of the sea’ some 25,000 or more per year, with an annual gross of about $500,000. However, by 1947, due to scientific research, Vitamin A could be synthesized and was therefore much less expensive. In time, the man-made vitamin supplanted the natural one obtained from the shark and by July 1950, the Borden Corp. business in Salerno was closed. 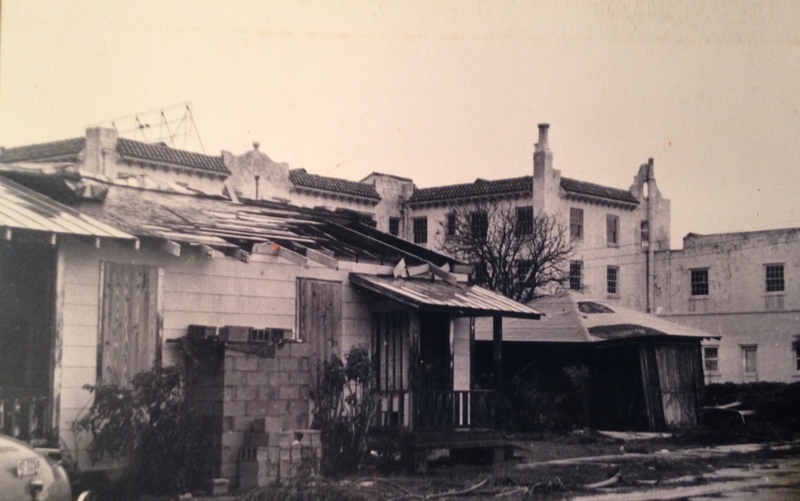 In June 1962, the Shark Industries factory was burned to the ground by the Port Salerno Volunteer Fire Department as a fire practice drill. 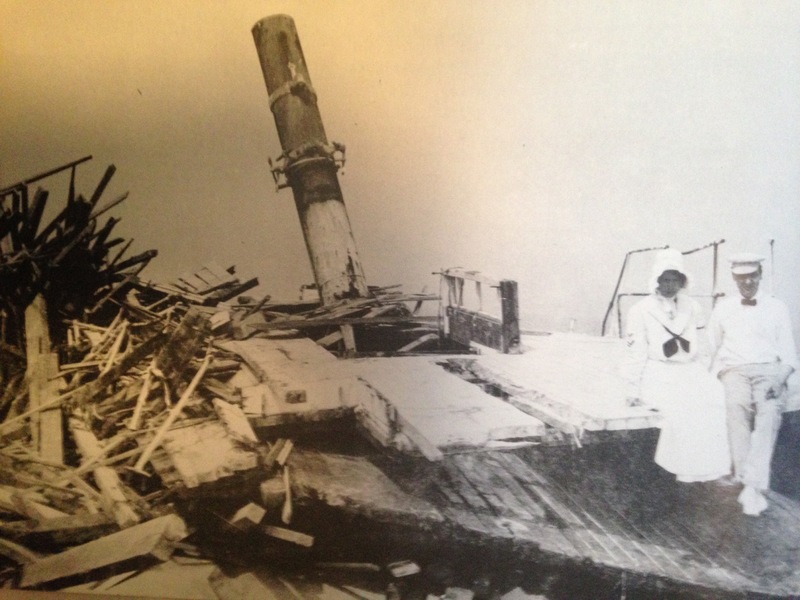 The remains of an industry which had gained national attention, recognition and perhaps gratitude, was gone. With some imagination, those in Salerno may sense that distinct aroma still lingering in the air. 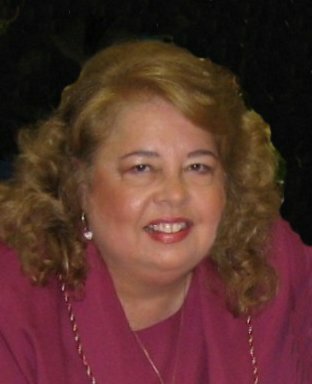 Alice L. Luckhardt is a freelance historical researcher and writer and member of the Board of Directors for the Stuart Heritage Museum and researcher for the Elliott and House of Refuge. In 2008, when I was first elected to the town commission of Sewall’s Point, I was appointed to be on the Treasure Coast Council of Local Governments, and sister entity, Treasure Coast Regional League of Cities. 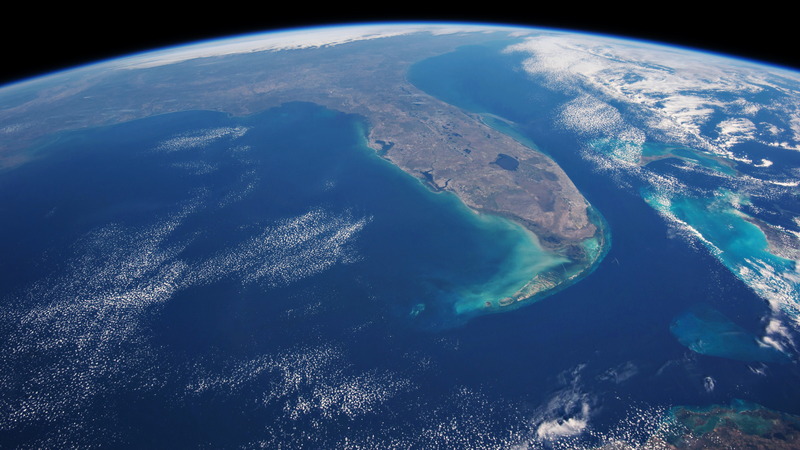 These wonderful organizations consist of elected officials from Indian River, St Lucie, Martin and Okeechobee Counties–counties on, or connected to, the Indian River Lagoon. 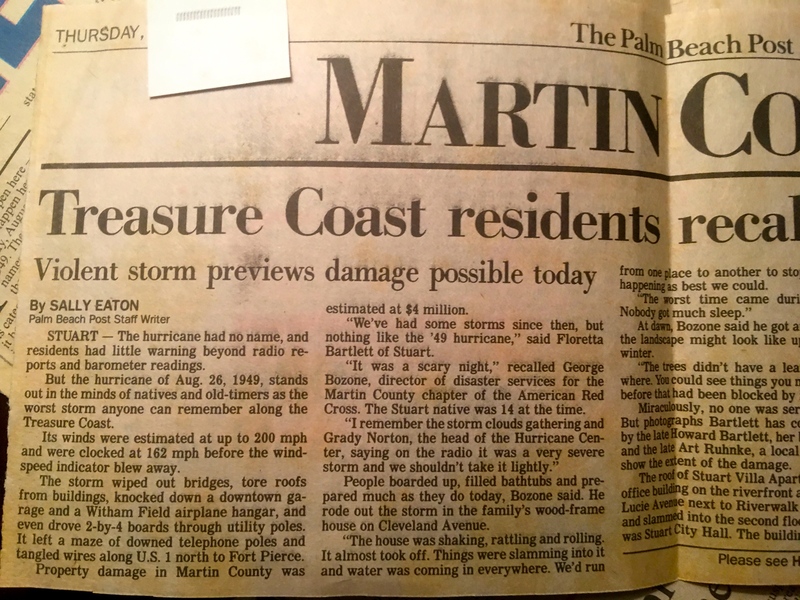 One of the first discussions for the “League” was organizing to change the name of our region from “Treasure Coast ” to “Research Coast.” The goal at the time, in the wake of the Great Recession, was to attract research companies to our area, and this name change was believed to facilitate this goal. The discussions lasted months and finally the idea to change the name was dropped. Treasure Coast prevailed. Many others held my sentiments; the discussion had been going on for a while before I got there. It was controversial to say the least. In the end, I felt we’d “won,” but others felt we’d lost an opportunity. 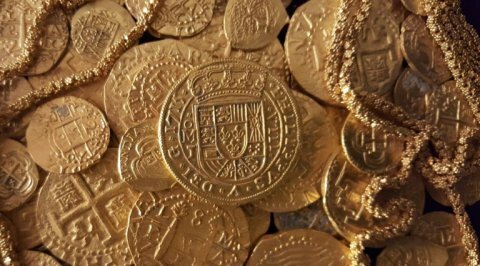 The recent findings of gold treasure off of Ft Pierce by Queens Jewels LLC as reported by the Brinson family is just what is needed to reinvigorate our “Treasure Coast” identity and tourism is big business! As we all know, Sebastian, Jupiter, Martin, Vero, and others have a rich history in unearthing treasures from along our shores and not all of it is gold. Lumber, pottery, gems, pearls,—the remaining ship itself and the swimming sea of creatures that have made these wrecks their home is enough for me! Years ago, I went snorkeling off of the House of Refuge to see the Georges Valentine ship. It was fun and very near shore. You could always see the House of Refuge. 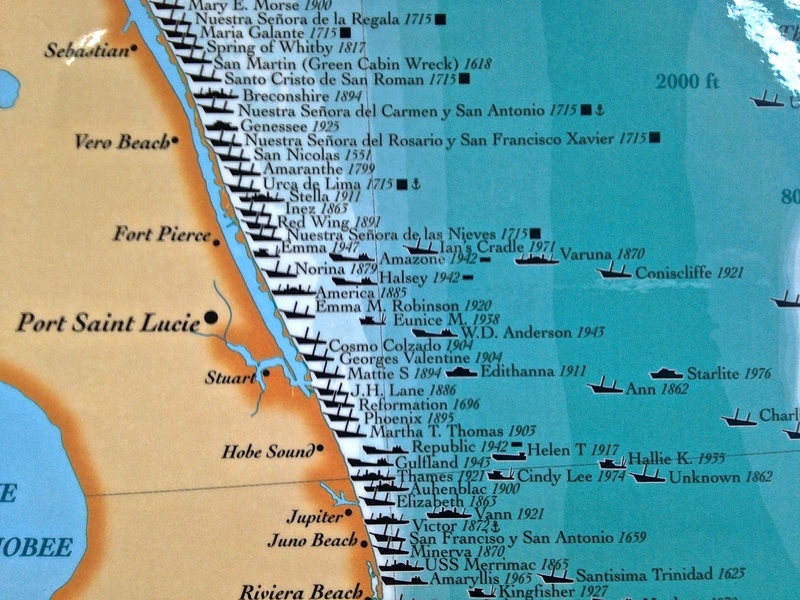 I think I’ll get my husband to take me again to celebrate the findings off of Ft Pierce, and to pay homage to those over one-thousand souls who died in ships bound for Spain during a relentless hurricane 300 years ago this past July weekend. Maybe you’ll go too? Have you already been? Did you find any gold? If you want a simple map to get started, Stuart Heritage Museum at 161 SW Flager has a great one and it’s great for kids. 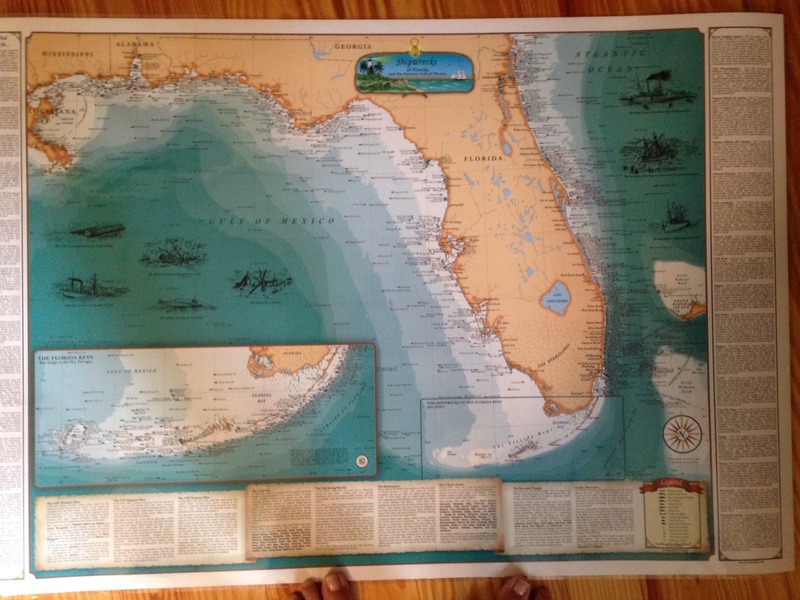 Entitled “Shipwrecks of Florida and the Eastern Gulf of Mexico,” it gives a great visual history of all….to see why we are and always will be THE TREASURE COAST! “Drifting on the surface of a Florida jungle river, like the South Fork of the St Lucie or the Northwest Branch of the Loxahatchee, I experience the feeling that nothing is ordinary, nothing is commonplace. 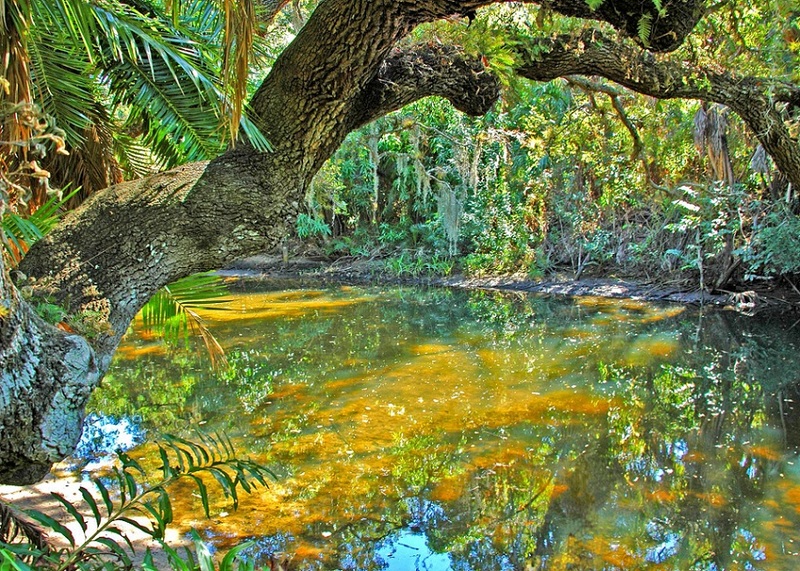 The onyx surface of the water reflects in perfect color the images of the bushy-headed cabbage palms, the moss draped live-oaks and cypresses along the banks. 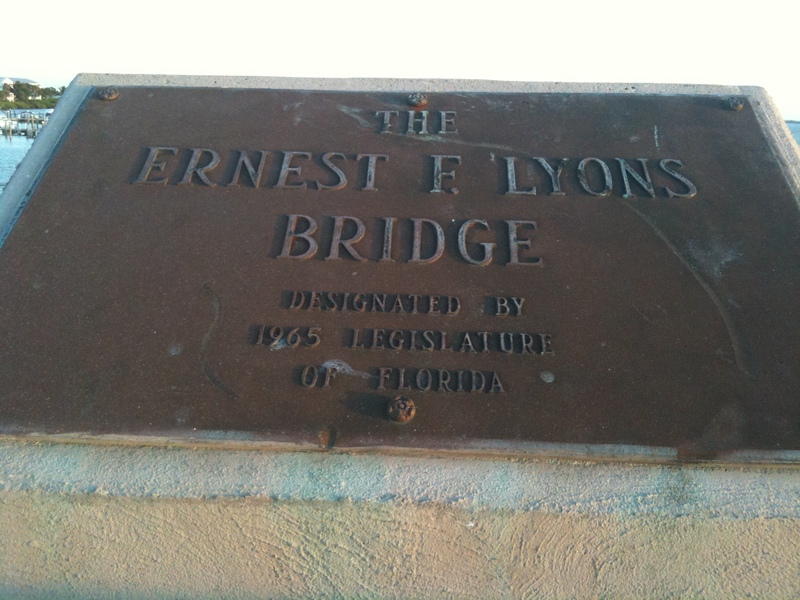 Ernest Lyon’s Bridge marker for the bridge between Sewall’s Point and Hutchinson Island, designated in 1965. Photo JTL. 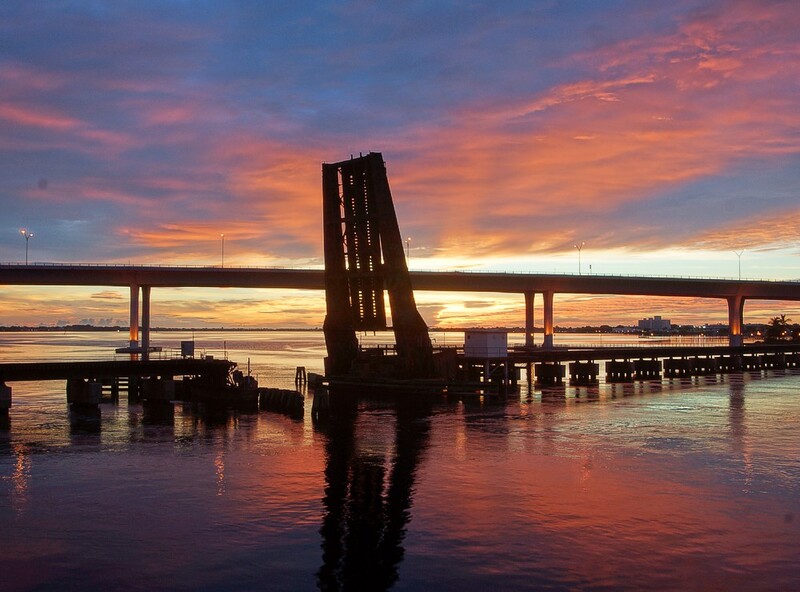 Sunrise Roosevelt Bridge draw bridge, photo by John Whiticar, 2014. All Aboard Florida and NOT All Aboard Florida have Henry Flagler’s East Coast Railway on the front page of every paper along Florida’s Treasure Coast. History and urban legend have some railroad stories of their own I’d like to share…. According to the book, The History of Martin County, Henry Flagler wanted to extend his railway through Sewall’s Point between the St Lucie River and Indian River Lagoon, but instead had to take a sharp easterly turn near Rio in order to cross the shortest point of lands along the St Lucie River, near today’s Downtown Stuart. Railroad takes a sharp easterly turn over St Lucie River at today’s Downtown Stuart. By February of 1894, Henry Flagler’s East Coast Railway was as far south as Fort Pierce, and he planned to extend it along the Indian River Lagoon through Jensen Beach on through Sewall’s Point, and then to build a bridge across the St Lucie, to what is now Port Salerno, and so on to Palm Beach where he had already built a luxury hotel. 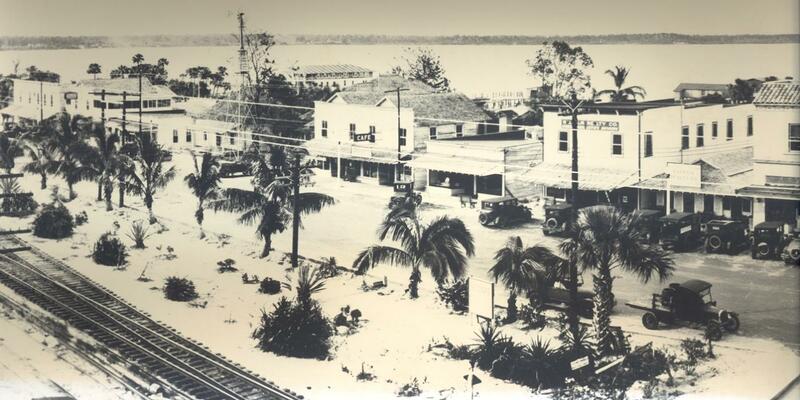 Running into opposition from pineapple growers who did not want railroad tracks through their plantations, and refused to sell him the right of ways he needed, Flagler faced a serious problem. Far sighted Walter Kitching with an eye to commercial improvement of his own property, was only too happy to solve the problem. Owning property on the St Lucie including at the area where the railway bridge now crosses the St Lucie River along side the present Roosevelt Bridge , Kitching offered Flagler the right of way he needed provided the railroad went through his property: “I offered the railroad $200 in cash and all the land they required if they would give us a railroad dock and a depot on this side. 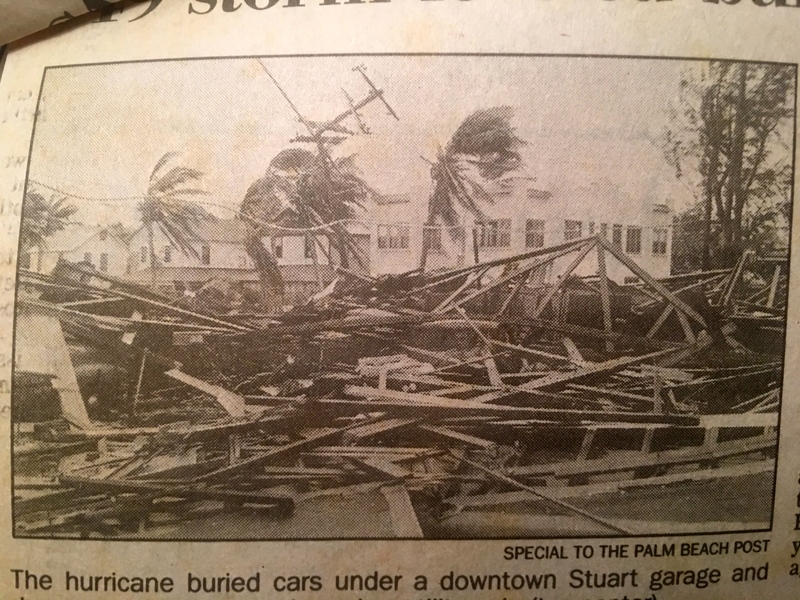 They accepted the land and built the dock.” Downtown Stuart was born. History is sometimes hard to really know as it “becomes” what is written. 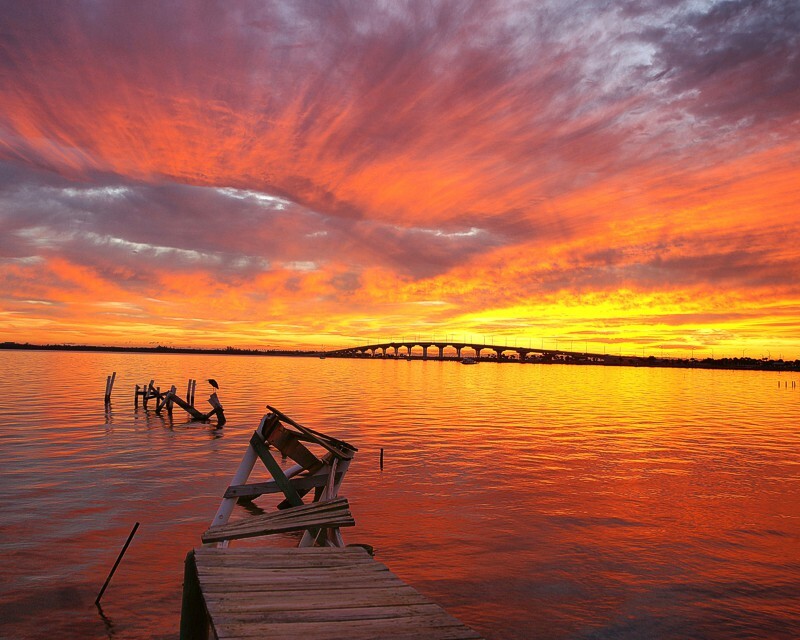 However, one thing is certain, for now, the sun always rises and the sun always sets, and a bridge is a symbol of the people and the times along the St Lucie River/Indian River Lagoon. Sunrise over the fishing pier at the Roosevelt Bridge. Photo by John Whiticar, 2014. Thank you to photographer of Whiticar Boat family fame, John Whiticar, for allowing me to share his beautiful photos. 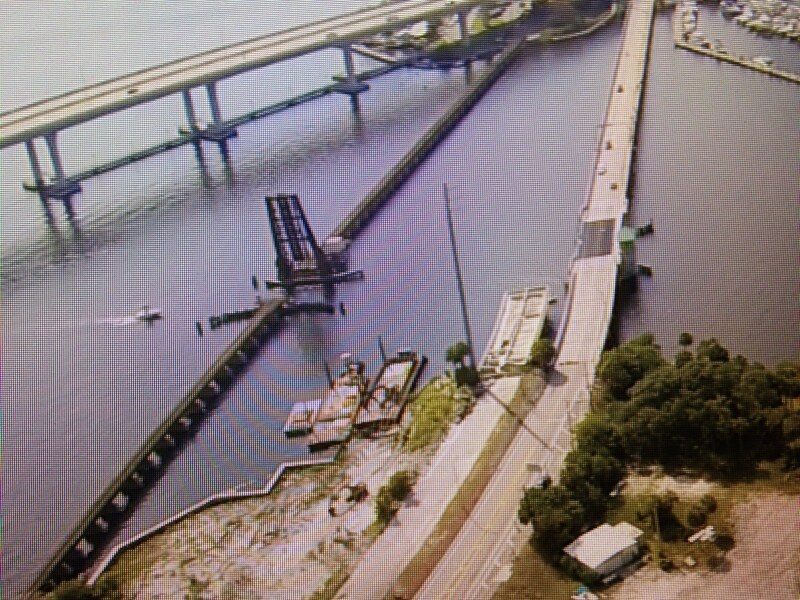 His words: “Going across the old Roosevelt Bridge in Stuart Florida this morning facing the new Roosevelt and old Railway bridges; Second photo is the fishing pier under the bridge.” September 22, 2014.